As a wildland firefighter or fire department, your goal is to remain protected from the elements and the dangers of a fire, but maintain comfort and maneuverability. Does your current wildland fire gear meet your needs? At Lakeland, we believe that your wildland gear doesn’t have to be antiquated. Step up your comfort with ergonomic, athletic gear that is designed to move with you. View and download a free PDF Wildland Fire Gear Infographic now and learn more about the ideal features for wildland fire gear, below. Wildland firefighters demand ergonomic, athletic gear that maximizes functionality and performance. That’s why all of Lakeland’s firefighter gear includes the same ergonomic cut. Vertical back pleats make improved flexibility and maneuverability a reality. 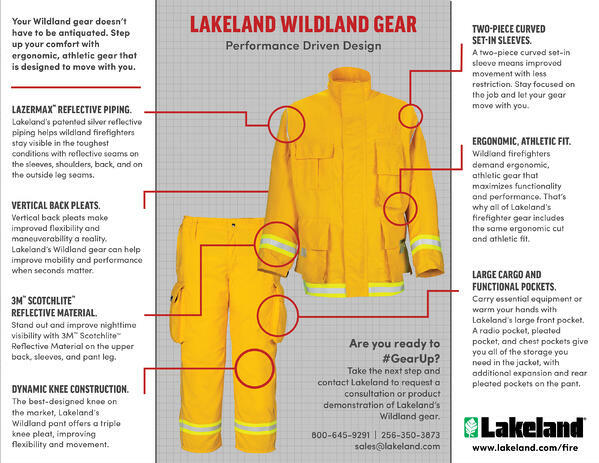 Lakeland’s Wildland firefighter gear can help improve mobility and performance when seconds matter. Lakeland’s patented silver reflective piping helps wildland firefighters stay visible in the toughest conditions with reflective seams on the sleeves, shoulders, back, and on the outside leg seams. Stand out and improve nighttime visibility with 3M™ Scotchlite™ Reflective Material on the upper back, sleeves, and pant leg. Large Cargo and Functional Pockets. Carry essential equipment or warm your hands with Lakeland’s large front pocket. A radio pocket, pleated pocket, and chest pockets give you all of the storage you need in the jacket, with additional expansion and rear pleated pockets on the pant. A two-piece curved set-in sleeve means improved movement with less restriction. Stay focused on the job and let your gear move with you. The best-designed knee on the market, Lakeland’s Wildland pant offers a triple knee pleat, improving flexibility and movement. If you’re interested in learning more, take a look at Lakeland’s robust line of turnout gear.